For the past few nights something new has turned up here at the farm. 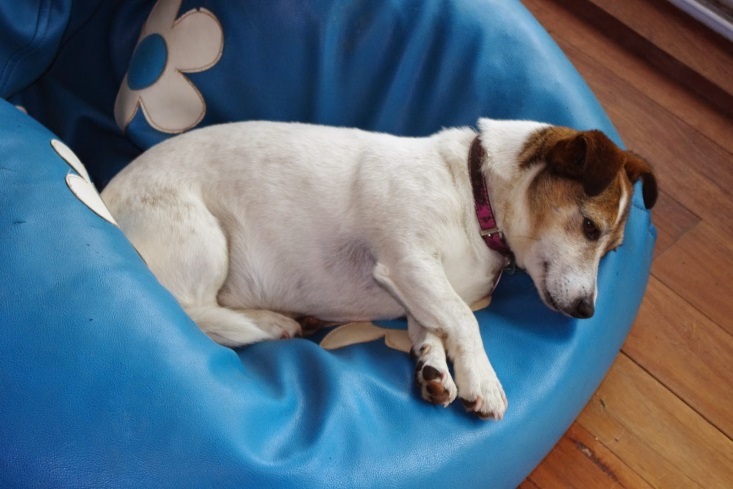 Scritchy – the boss dog – and I, go for a walk at night to keep an eye on the kangaroos, wallabies and wombats just to make sure that they’re not wreaking too much havoc in the orchard. The past few nights the torch that I carry on those walks has shown that we’re being watched by a set of eyes glinting in the torchlight. Those eyes when spotted quickly run for cover and then peek out at us from a nearby hiding spot. The title of this week’s post is actually a nod to a 2006 zombie film. It is a known fact that zombies clamour for brains. I was hoping that the eyes in the forest weren’t a zombie clamouring for my brains as I believe that would be an unpleasant encounter with an uncertain ending. Maybe the eyes were actually after Scritchy’s brains as she is boss dog here after all? Who knows? 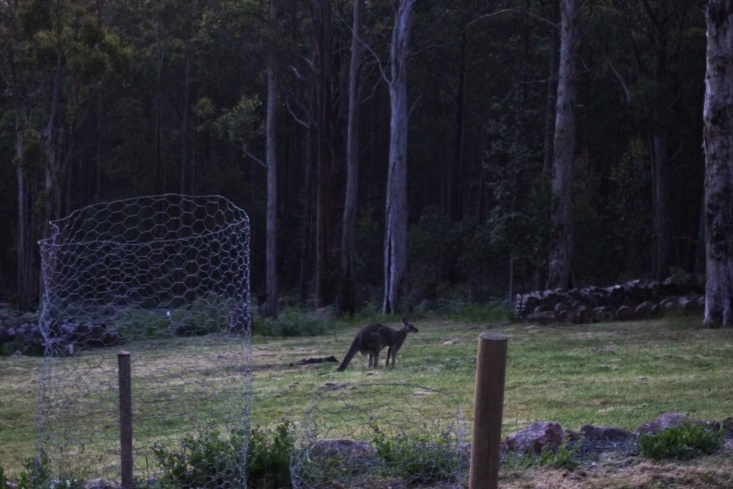 The kangaroos, wallabies and wombats were certainly aware of the new intruder, but they were mostly unconcerned by the new presence. I took this to be a good sign as it is good common sense to avoid zombies and wombats and their friends generally display good common sense. After a couple of nights of the furtive behaviour from the eyes, the intruder displayed themselves for the creature that they actually belonged to. Fortunately for the readers of this blog it wasn’t a zombie as I’m uncertain as to whether I would survive such an outcome and few people would want to read a blog that went like: “brains, brains, brains … moan”. Honestly it would get quite boring after only a very short while. The eyes became comfortable with the torchlight and eventually the new presence revealed itself to be two fox cubs. I’m not sure what to make of this new addition to the farm. The Aboriginals believed that the Dreaming has two rules: obey the law, and leave the world as you found it – not for better or worse, for God judges that, but the same. The first rule enforces and exists for the second. Together they let place dominate time, and translate well understood ecological associations into social relations (taken from The Biggest Estate on Earth written by Bill Gamage). This is not an entirely helpful set of rules as to what to do about the fox cubs and it is worthwhile mentioning that dingoes which are the native dog (similar to a coyote) presumably arrived on this continent via a trade between the Indonesians and Aboriginals many millennia ago. The dingoes then out competed the Thylacine’s (Tasmanian tigers) on the mainland and resulted in that species extinction on the mainland. Certainly there are no wild dogs in this forest though. At this point I’m going to take an observe and wait approach to the two fox cubs here. On a positive note, the rat, field mice and rabbit population here has taken a savage blow so perhaps there is a place for them at the farm? 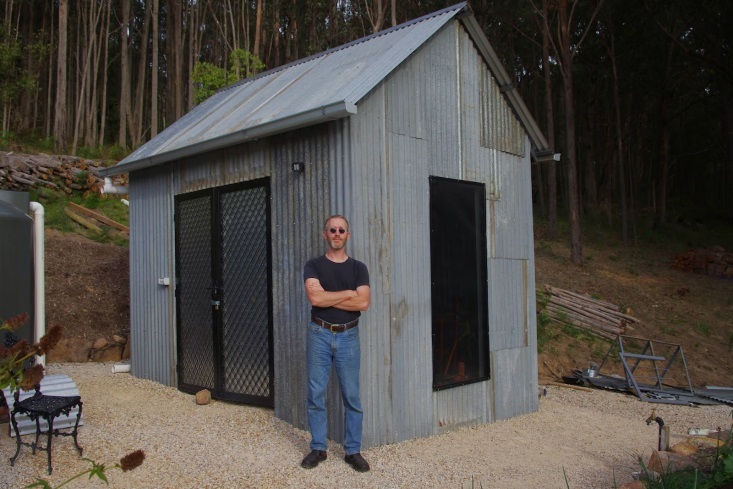 Returning back to the zombie theme, I’ve recently installed a stainless steel mesh over the glass and timber door to the cantina shed. Alright, it wasn’t actually for zombies, but it was to reduce the likelihood of that door breaking during a bushfire. 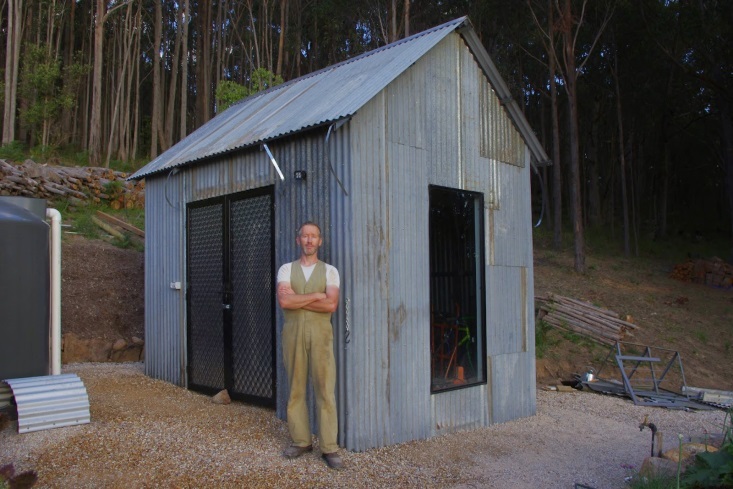 I also installed an aluminium door jamb on that particular door and very observant readers will notice that the underside of the cantina shed is now enclosed by dark grey corrugated steel sheeting. It is also worthwhile mentioning that Scritchy the boss dog, has a secret talent (well it isn’t secret anymore!). She knows when it will rain here and is all too happy to let me know by hiding under the bed. Unfortunately, she fails to be quiet whilst hiding and will happily provide at least 24 hours’ notice of the impending rain – which is probably more than a few too many hours advance notice for my undisturbed sleep. The photo also provides an update on the tale of the two tomato beds with the planting being only two weeks apart. This year, I’m also trialling some steel reinforced mesh to ensure that the tomato plants don’t fall over but keep growing upright. 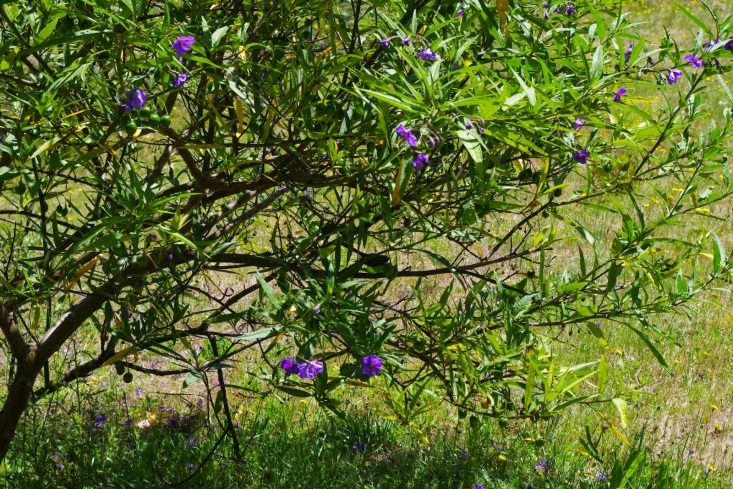 Speaking of tomatoes, there are a few good examples of the local species of the nightshade family growing here and I took the photo below of a Large Kangaroo apple (Solanum laciniatum) at the farm. There is even a small robin nesting in the foliage at the very centre of the photograph. Not to say that the plant growth hasn’t been going strongly here too (just not quite as quickly). 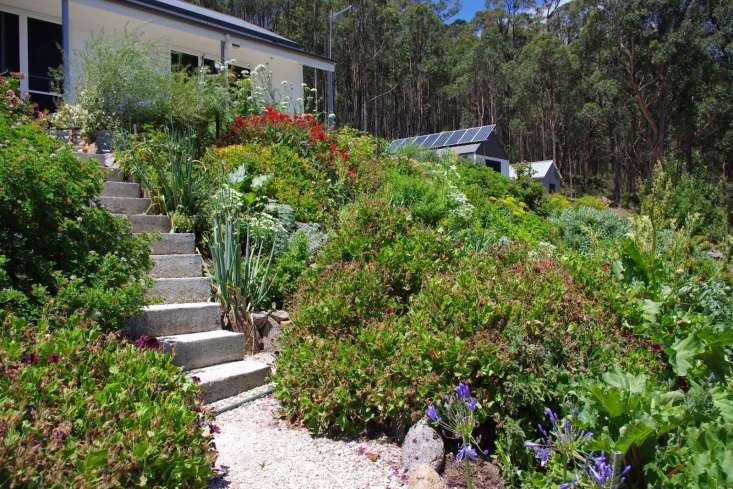 Unfortunately the flower garden has grown so much that it has taken over the paths and steps. Maybe it is triffids that I have to watch out for and not zombies? In the past, I’ve placed those plant cuttings in new garden beds as food for the worms. However, at this point in time I’m not making any new garden beds so have had to work out what to do with all of the plant cuttings. 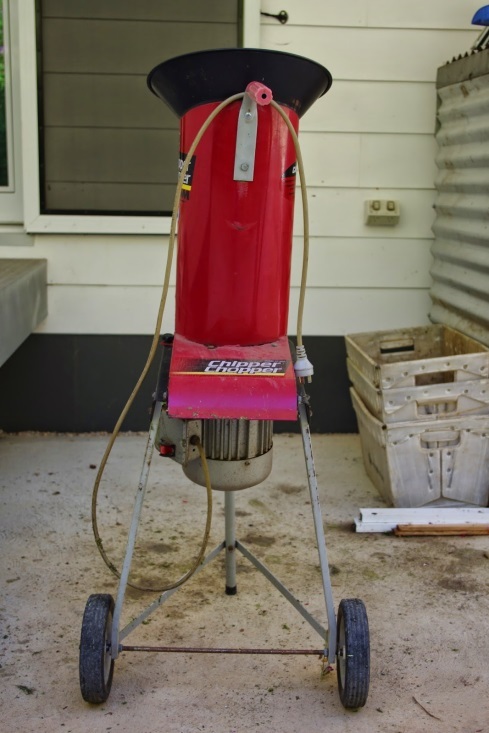 So last week, I picked up a 2hp second hand electric chipper chopper. What a great little tool. It rips up all of the plant cuttings so I can throw them back into the garden beds as a mulch. 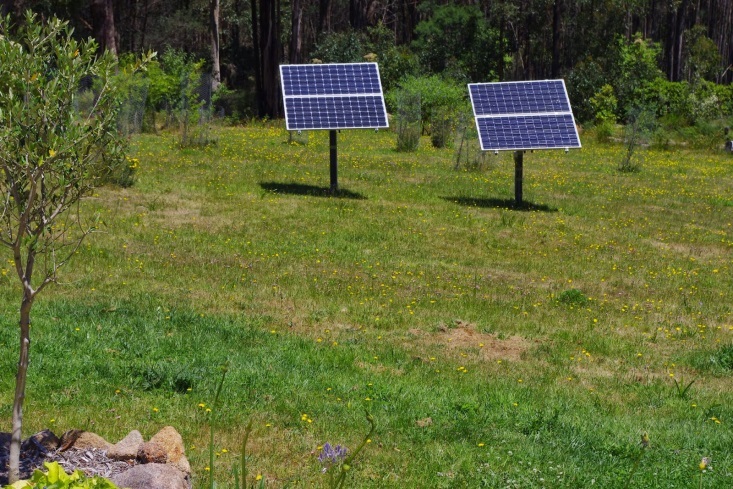 And at the same time I use up some of that electrical power with the off grid photovoltaic solar system which would otherwise be going to waste. Winning! The unit was purchased second hand for $55 and was sold because apparently it wasn’t very good. On bringing it back here, I found that the blades looked as though they hadn’t been sharpened since its’ manufacturing date way back in 1997. A quick sharpen and the machine was ready to go. In other farm news, the strawberries have gone on strike and decided to produce runners instead of fruit. 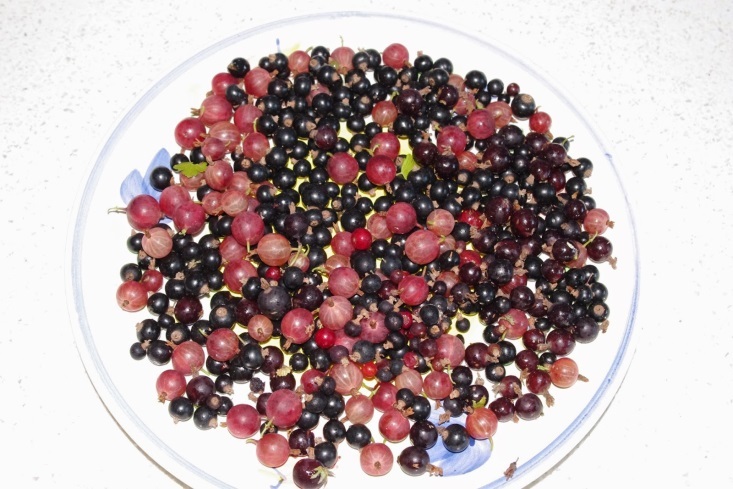 This is a real shame, but other berries have gone on to fill that gap and the black (and some remaining red) currants, gooseberries and jostaberries are all producing strongly this week. I’m going to have to learn how to propagate these plants which look as though they are from a similar family. If anyone has any time tested methods, please let me know? Way back in 1994 when grunge was still cool and Kurt Cobain hadn’t ended his own life so tragically, I went to a dinner at a cheap Chinese restaurant. It was at that dinner that I sat next to an attractive and engaging young lady. I’d known her for many years and in fact the first time that I’d met her, I didn’t even notice her because I was underneath my trusty old 4 speed Suzuki four wheel drive fixing the clutch lever which had broken again. I believe that at the time my feet gave a friendly wave. As an interesting side note, it is worthwhile giving a bit of hard earned advice at this point in time. Never buy a soft top (convertible) vehicle. Honestly I’ve never owned a vehicle that was broken into more than that particular car. I once had a CD player in there, but not for long. I kept down grading car stereos until I’d gotten to point where thieves would break into the vehicle, they’d take a look at the rubbish radio and then go: I don’t think so. They used to let me know that they visited frequently by leaving the zippers on the roof undone. Well done, there is a lesson in there about possessions I’m sure. Oh yeah, the Chinese dinner. Well at that particular dinner, this engaging young lady drew pictures of her Dachshund dog and other such fun things on my arm. I was intrigued. A week or so later Valentine’s day arrived, and fortunately I worked not too far from her house so after work I rode around on my push bike (remember it was the recession here) and dropped off some red roses and a card. A formal date was organised and due to circumstances beyond my control – but probably to be expected, the little Suzuki four wheel drive was in at the mechanics getting its gearbox repaired and I had to ask this young lady to pick me up. Now it should be pointed out that this situation is a total dating disaster, but fortunately the times were on my side and being the era of grunge such things were to be tolerated at best. The date went well and two weeks later I moved into her home – with of course her Dachshund and Jack Russell terrier and all of the other assorted share house people. It was a full house. Now it is worthwhile remembering that this was indeed the era of grunge and money was in short supply everywhere. 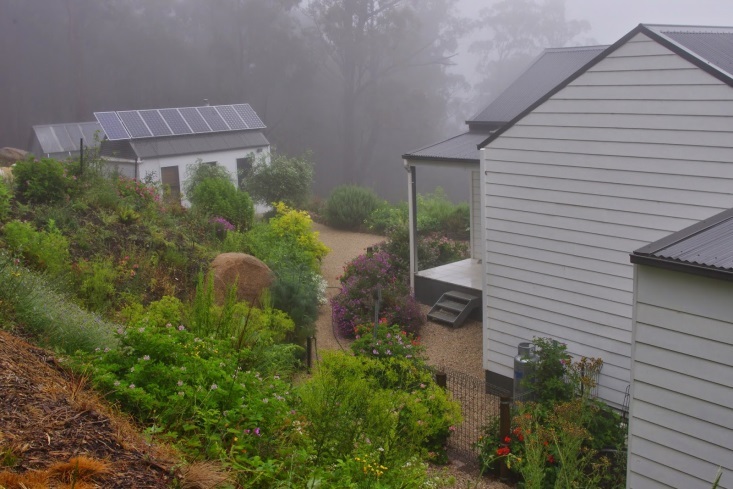 The house, despite being only four kilometres (2.5 miles) from the very CBD centre, it had a bathroom that was in a separate building in the backyard. What made winters at that house really challenging and interesting was that the toilet was in the rear corner of the backyard in what is known here as an outhouse. 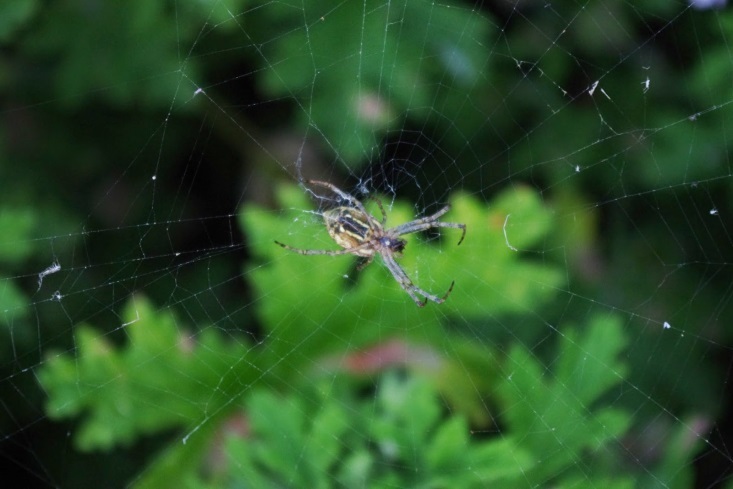 There were slightly more spiders than residents in that outhouse too. I was a bit dubious as to the claims that the carpet had been vacuumed sometime in the past six months and the furniture certainly looked as though it had been obtained through hard rubbish collections. Still that’s how it rolled back then and it was home enough for me and I was very pleased to be there. It might be an exaggeration to say that you can see the houses in the photos below from space (maybe), but they’re certainly very noticeable from many kilometres (miles) away. Yeah, I have to confess to my love of Christmas lights. 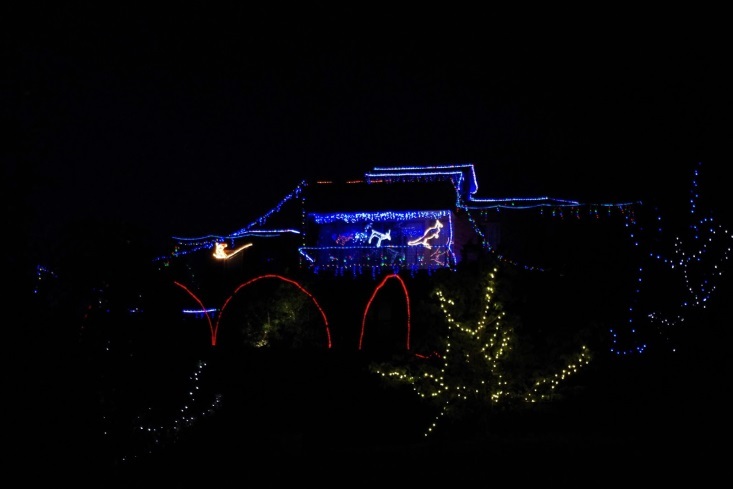 When every house on a particular street just goes feral and there are a crazy amount of Christmas lights all over every house and yard, it is certainly something to see! I can’t explain what it is about the display that I like and I freely admit that it is an incredible waste of resources and energy, but wow, it just looks amazing and people travel from all around the area to be both awed and amazed by the display. 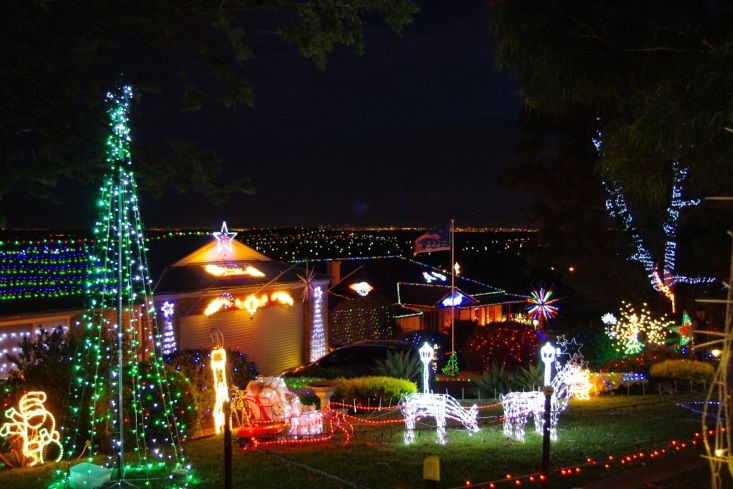 The display of Christmas lights over houses isn’t a common thing Down Under and that perhaps is why it draws so much attention. When I was a young child my mother used to take me into the city to see the displays at this time of year in the Myer department store windows. That department store had been preparing new and interesting displays at Christmas every year since well before the Great Depression and the people would turn up in droves – even today well into the night – to see what new display would be shown that year. Perhaps that is why I enjoy the light displays so much? Who knows? 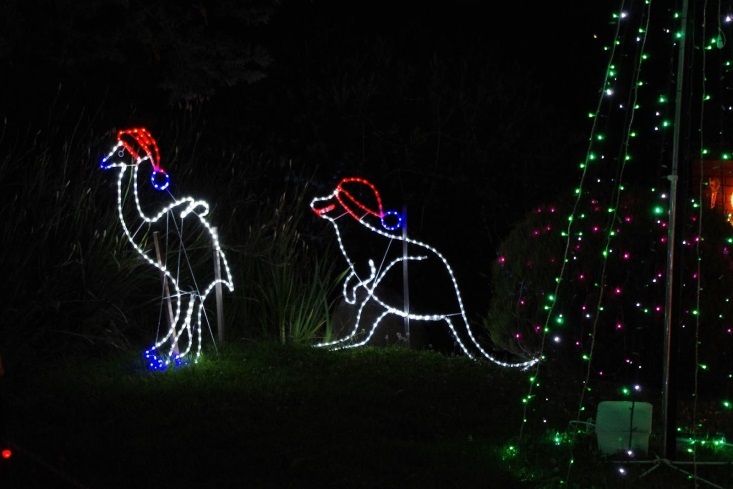 In all of the crazy light displays, I spotted a Christmas emu (which is a really massive native bird akin to an Ostrich) and a Christmas kangaroo. Well done! I also noticed that one particular house in that court had a reindeer which looked as though it was either drunk and falling over, or maybe it was about or about to eat the tail of the kangaroo next to it. The kangaroo however appears to be fleeing to safety.Top work! Christmas is at best a confused time in Australia. The iconography simply fails to conform to the real world experience. For example, I doubt very much whether there is a single flake of snow or natural ice anywhere on the entire continent and yet we persist with such confusing images as reindeers and dudes wearing heavy clothing. Honestly both of them would possibly die of heat exhaustion within hours of their arrival on the continent! The reality of Christmas Down Under is hot sun and turbulent weather. 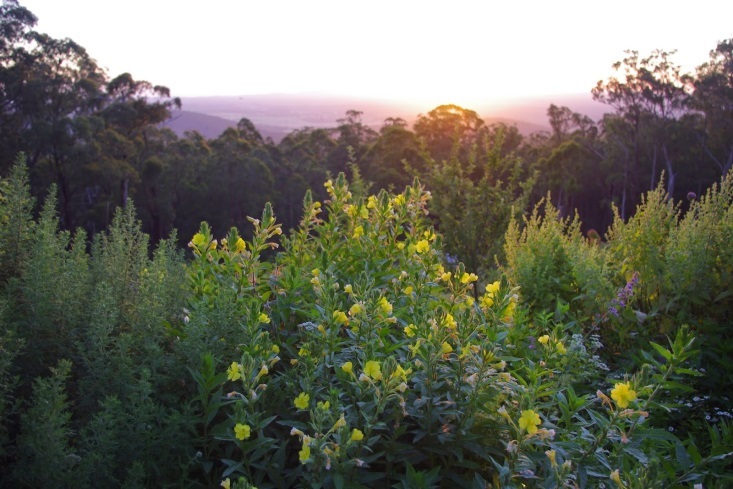 The photo below shows the sun setting over the flowering herb garden. The extra heat from the sun is causing the plants to grow. I’m now in the position of having to make the decision to prune all of that extra plant growth. 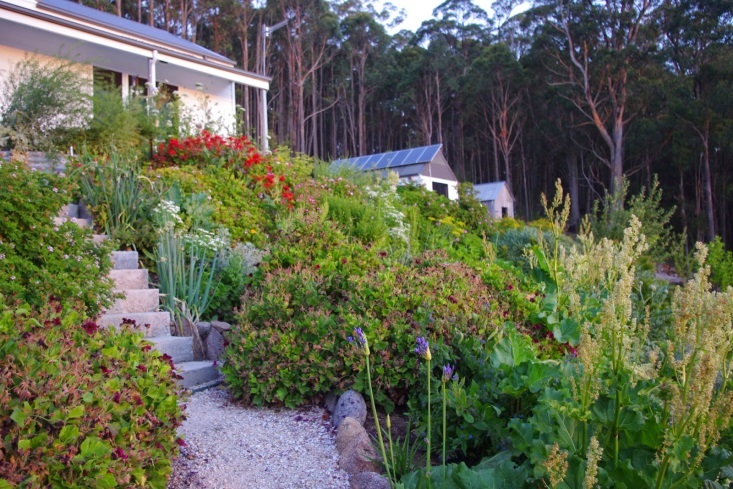 The photo below shows that the plant growth is now taking over paths and steps. It is like a feral jungle! I’m considering purchasing a second hand electric chipper to chip up all of this additional plant growth and then add that mulch back into the garden beds. It is a bit of an experiment and we’ll see how it turns out over the next few months. 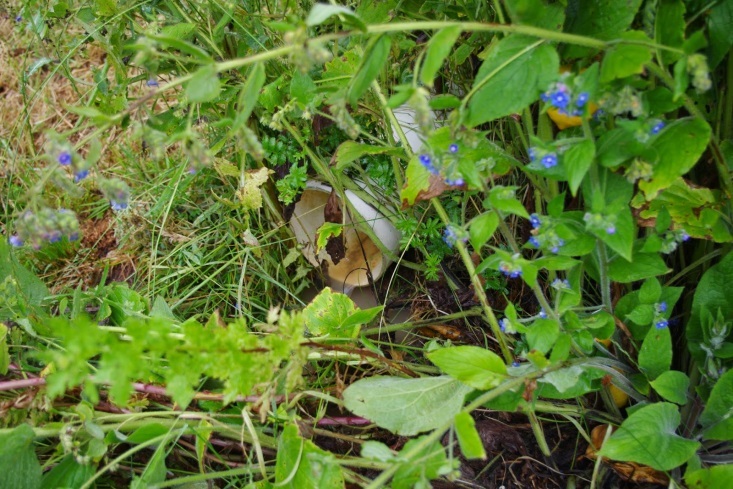 I spotted an unusual plant in the garden beds this week. It is a native yam (murnong daisy) and I’d forgotten that I’d even planted it. For the ancient Aboriginals it was the equivalent of the potato plant and they were widely cultivated across the continent. I’m looking forward to seeing how it grows and whether it self-seeds. As an interesting side note, it looks exactly like a massive and over sized dandelion and I’m reasonably certain that the large leaves may provide a long term summer green, a massive edible root and very reliable bee food. This week I added guttering to the new shed so that when it rains, I can collect that rainfall and direct it into the water tanks. 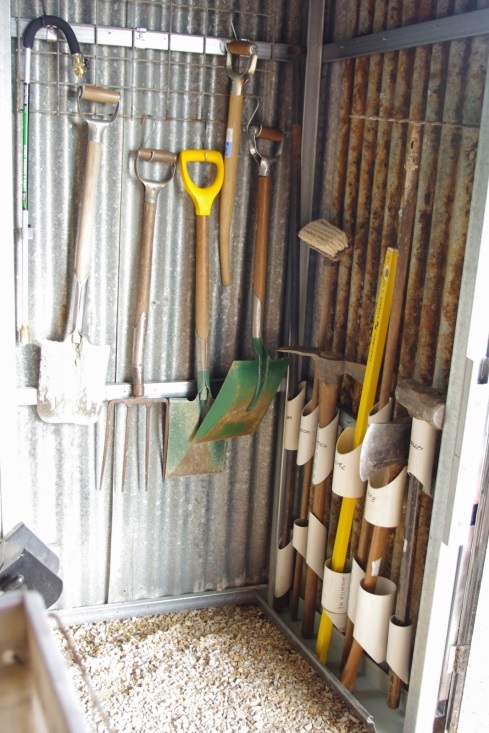 Roof areas in Australia are valuable real estate items for either collecting sunlight or rainfall (or both) and the work on the shed this week has effectively increased by half the amount of rainfall that I collect at that area of the farm. In the photo below you may also notice that I have installed a stainless steel mesh screen over the window to the shed. 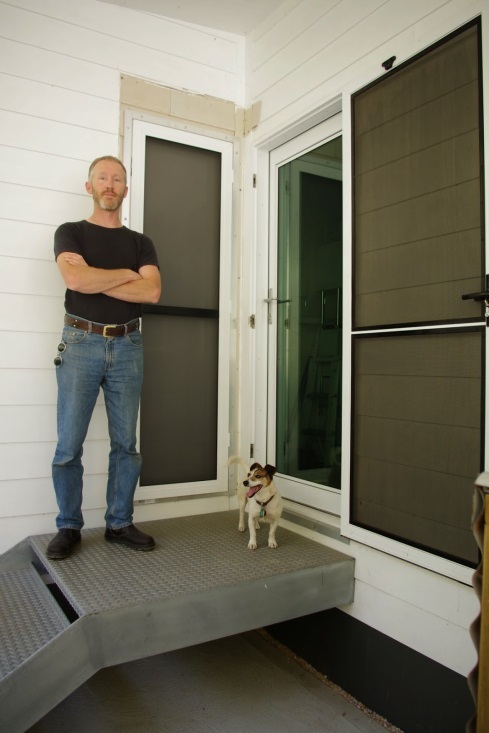 This mesh significantly increases the resiliency of that window (which is already two layers of 5mm (0.2 inch) double glazed and toughened glass) in the likely event of a bushfire. Over the years I’ve experimented with different systems at the farm here and one of them was a totally rubbish idea which I’ve only just corrected this week. 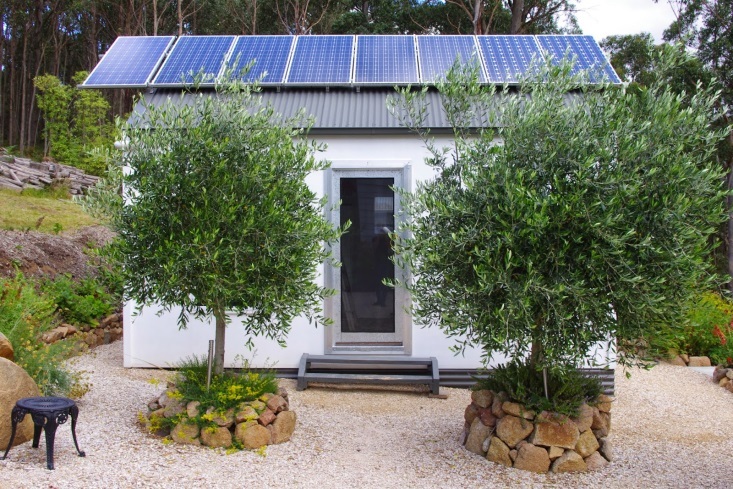 When I built the house I installed a timber door on the room where I store the batteries for the off grid solar power system. Now ordinarily this wouldn’t be a problem, except that I’m in a bushfire area and timber doors tend to burn when exposed to flame and heat. In order to comply with the building regulations here, I had to then fit a fire tested roller shutter over that timber door. That fire tested roller shutter wasn’t too difficult to source and fit. However, unfortunately it had to be electrically powered in order to roll up and down. Again, this wouldn’t be a problem except that one day a year or so back, without thinking about the consequences, we started using a lot of electricity in the house (well over 9kWh) in short succession. The power system quickly over heated due to the very high demand and in order to protect itself, it shut down. Now very observant readers may be able to see where this story is going. After the power system shut down, I thought that I’d enter the battery room and reset the electronic equipment. It was at that point that I realised that the fire tested roller shutter covering the timber door was closed and I had no other way of getting into the battery room to reset the electronics. That problem is now fixed and I have secured a sheet of steel over the timber door, replaced the door-jam with aluminium and installed a heavy duty stainless steel mesh door on the outside whilst removing the fire tested roller shutter. There is truly something to be said about keeping systems simple. The recession of 1990/91 left me with a feeling of vulnerability. So began my wilderness years where I worked long hours in various jobs. During that time I continued part time study at University at night to achieve an under graduate degree. Then after the 8 years that was required to achieve that particular goal, I continued on with further education and completed a post graduate course. Over the years I progressed from one job to the next and eventually rose to the very top of my profession. It was all heady heights and heavy responsibility. Alas, I am not one of those born to handle heavy responsibility well. Perhaps it was my experiences during the recession early in my adult life. Who knows for sure, but employment left me feeling like an uncertain lover happily bedding their partner, but forever looking over that partners shoulder to different opportunities. Patience is defined as the capacity to accept or tolerate delay, problems, or suffering without becoming annoyed or anxious. It is a useful character trait and on the off chance that I fail miserably at displaying any of those qualities, the wombats here show me just how it should be done in true style. Now your average wombat is a sensible creature. In fact if any fictional character portrays the characteristics of a wombat it would be one of Tolkien’s fictional Hobbits. Not only do wombats live underground in extensive burrows which become expanded and enlarged with successive wombat generations, but they also dislike adventures. It is only the very poor or sickly wombat that would get caught out in the rain and end up with dirty paws. Heaven forbid! 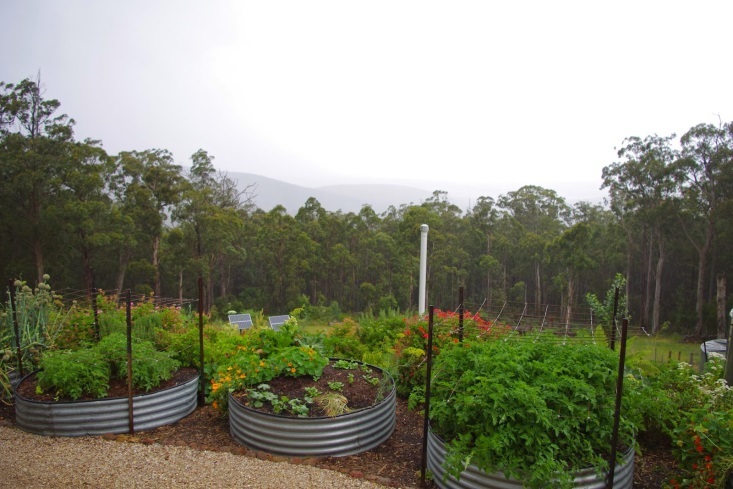 Last week, a massive tropical low pressure system dumped just shy of 80mm (3 inches) of rainfall at the farm. 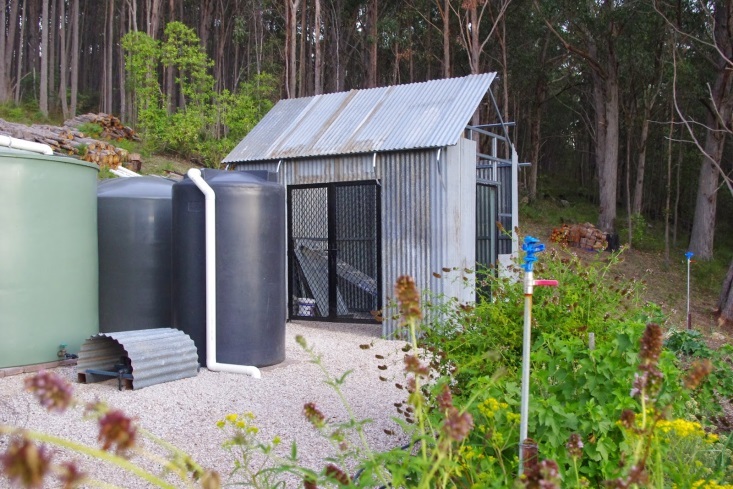 Every single drop of rain was gratefully received and stored in water tanks or in the groundwater table. Much further north of here: http://www.weatherzone.com.au/news/heavy-rain-in-central-queensland-celebrated-as-a-blessing-for-drought-declared-areas/202128 300mm (12 inches) of rainfall fell from the sky. Now wombats being sensible creatures, simply wait in their cosy burrows for the rain to stop falling. Every now and then during those rainy days, I’m sure they have a bit of a sniff of the air and put their noses outside of the burrow and go, “No. It is still a bit damp for me, I think I’ll catch up on a bit of much needed rest”. Well, after the rain fell, the herbage grew and the wombats came out in force to graze. 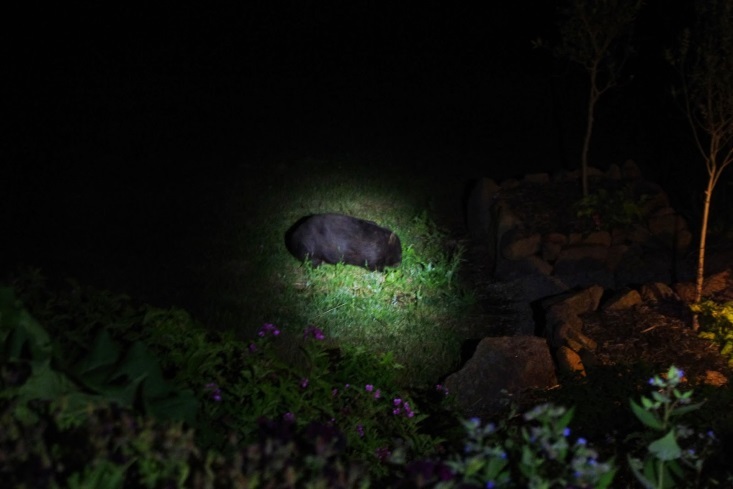 Below is a photo of Fatso the wombat enjoying the lush herbage over the worm farm trenches from only a few nights ago. It is worthwhile pointing out that Fatso has an exceptionally glossy coat. Wombats know how to wait. They have patience in spades. I also spotted Baby wombat a few days ago. Baby wombat has this year become Mummy wombat. Her single mini-me sized off spring was trailing along dutifully behind her. It was beautiful to see, but unfortunately, I didn’t have the camera to hand at the time. Patience is a virtue because the few rainy days were put to productive use preparing bottled apricots for the winter. During that time, I also considered cooking up some of the summer fruits into a jam which I could eat later in the year. But then I wondered just how much jam was currently in the pantry cupboards? It was a difficult question because I honestly didn’t know the answer. One of my maxim’s here is that if you are thinking or wondering about a system then that system probably isn’t working. So a couple of hours later, I’d pulled every bottle of preserves from the pantry cupboards, sorted them into flavour and the date they were bottled. This sorting process produced the somewhat surprising discovery that I had almost an entire year’s supply of jams and chutneys ready to eat. There were even flavours that I’d completely forgotten I’d even made. 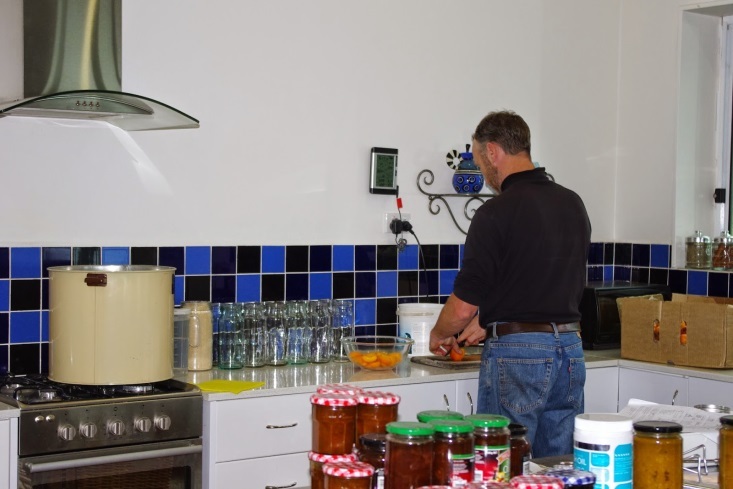 All of the preserves were then labelled and stacked so that the stores could be assessed and known at a simple glance. There are also some bottles of mead, lemon and ginger wines all happily fermenting in the racking too. They won’t be ready to consume for another six months at least. 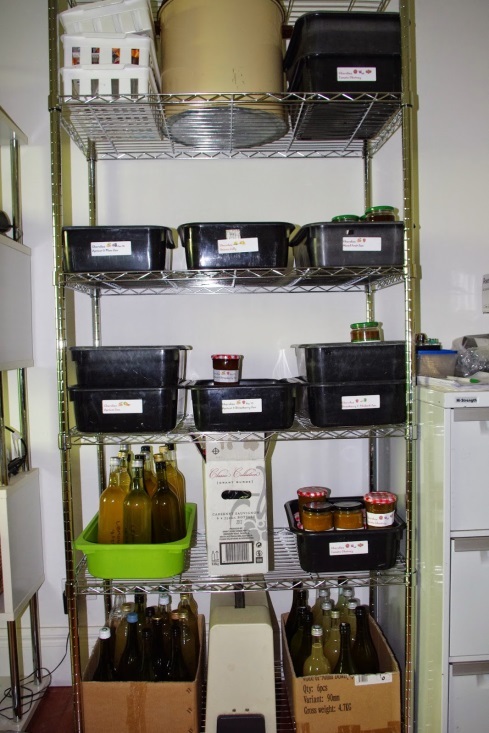 The interesting thing that was also highlighted in this process was that I’d completely run out of bottles to store future jams and chutneys in. At this point, it is worthwhile mentioning that my editor happily noted that a few months ago that in my naivety I’d given away about 20 empty bottles! Not good, so I thought that it was perhaps a wise activity to rapidly investigate how to purchase more bottles and discovered to my horror that: the cost of the glass bottles used in commercial jams was a large percentage of the shelf price of the product! Yikes! That was a mistake not to be repeated in the future. As a further related note, all of the preserve bottles used here share common lids or caps depending on their particular function (fruit, jams/chutneys and alcohol). Now that the rain has stopped and the wombats are happily going about their business, there has been an increase in the insect activity at the farm here. The spiders are never shy in taking advantage of this sudden boom in insect activity and I took a photo of this Golden Orb spider which had happily caught a few of the bees here. The new machinery shed is progressing too and it is literally at the eleventh hour in its construction phase before the inevitable completion. It even has low voltage LED lights installed inside and out! Observant readers will note the two scabs on my face which were the result of an unpleasant and painful accident with a sign at an electronics shop in Melbourne a few days ago. Whilst that must rank as one of the nerdiest accidents ever, it also gave me a certain sort of fight club look? Back to the shed though, the doors which were a gift from a neighbour gave me some problems because being security doors they were built to have flywire covering the back of them. They came with fibreglass flywire which is great to keep insects out, but completely useless if a bushfire ever came through this area. Try the experiment at home sometime and chuck a small section of fibreglass into a fire and it will disappear in seconds. The whole problem was simply resolved by attaching a sheet of galvanised steel to the back of the doors. 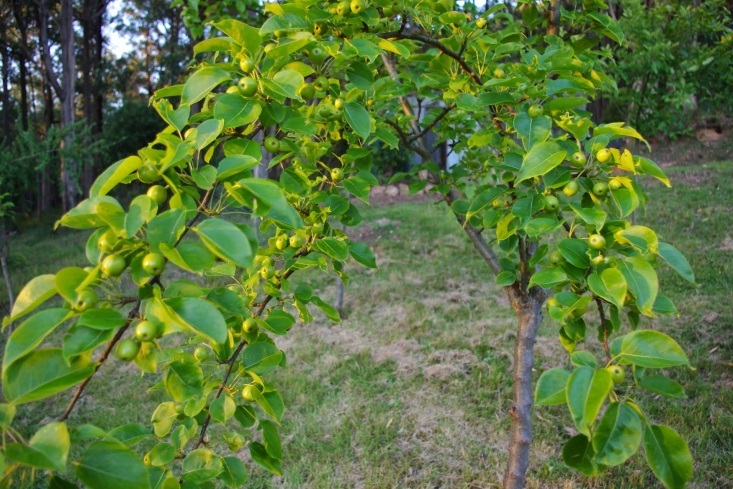 The Asian nashi pears are also ripening at the farm and when they are ripe, that fruit is both sweet and juicy. I previously mentioned my grandfather because my father disappeared when I was so young that I don’t even remember him. As an interesting side note, I met my father as an adult through a strange set of coincidences involving a friend and I intuitively understood the disappearance situation far more clearly. It was no loss. Single mothers do it hard and so upon completing high school it was no hardship at all for me to head off into the wide world as an independent adult. Ambition certainly wasn’t a word that I would use to describe my outlook in those days. My first job in the work force was with a State Government authority and I enjoyed the rich social life of that organisation and have many fond memories. It wasn’t all slackness though as I began the long process of University to achieve an undergraduate degree on a part time basis whilst working full time. Incidentally, the first year that I enrolled at University was also the first year that students were required to take government loans to pay for their course fees. Alas, all good things come to an end though. In this case it was perhaps far sooner than I personally cared for. Australia had a recession in 1990/91 whereby unemployment reached around 11.3% of the workforce. The State Government cut costs and I was one of those people that had to look for another job. As an independent adult, moving home was not an option. Rent was due monthly so I had to do whatever it took to put food on the table. So, I spent the next four years employed as a debt collector for a large corporate firm. Very few jobs teach you more about the depths of the human soul than that particular job. The temperature outside here at about 8.30pm is 15.0 degrees Celsius (59.0’F). So far this year there has been 810.0mm (31.9 inches) of rainfall which is up from last week’s total of 805.0mm (31.7 inches). 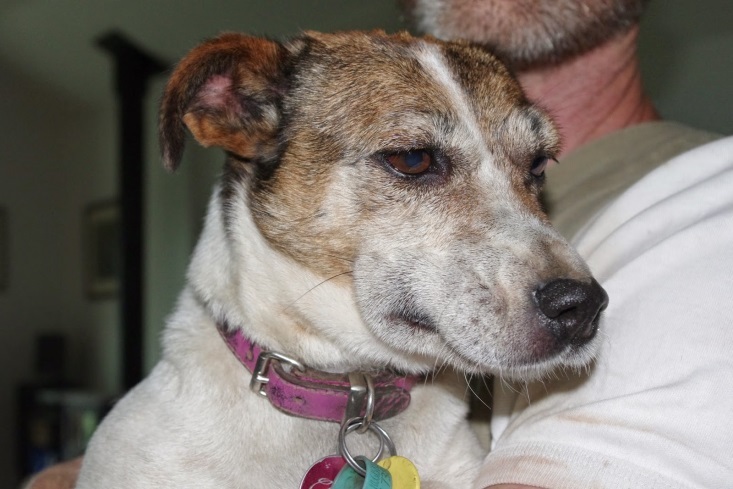 Scritchy, the miniature fox terrier who is notable for her recent misadventures at the farm, has been in even more trouble this week. She rules her dog pack with a white short haired iron paw, claiming all the best food and nesting spots and generally directing the other dogs to do her bidding. 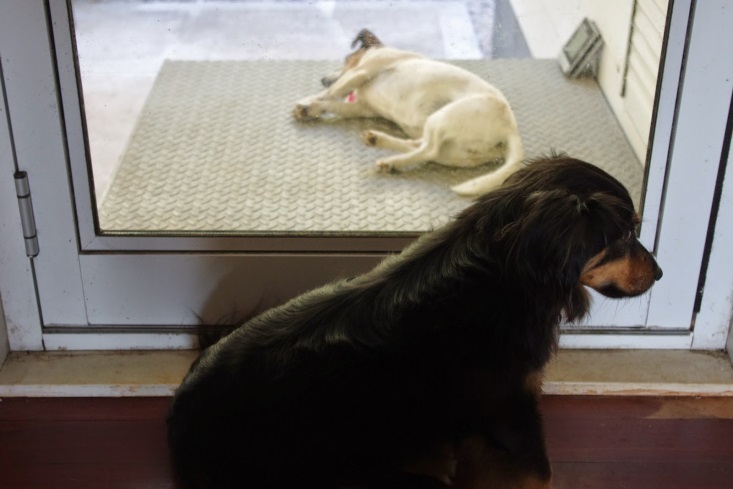 Ordinarily, this would be an advantage in the canine world. Not so, this time around. I’m truly unsure what happened to Scritchy, but last Thursday I picked up a new bee colony. Bees can be easily annoyed at the best of times and relocating a hive is a really good way to annoy them. I set the bee colony up and left them to their own devices to settle into their new home. Scritchy however, had other plans. Curiosity probably got the better of her and without first sending one of her minions, she obviously decided to check out the new bee colony herself. I wonder whether she thought that she would make new friends with the bees. Anyway, the bees expressed their displeasure at being relocated to a new home by stinging Scritchy on the face. Observant readers will spot the skin on the inside of her ear which is very red and inflamed. She was one very itchy dog and clearly distressed, so I slipped her a quarter of an anti-histamine tablet and she promptly fell asleep for a few hours whilst the swelling subsided. The following day (Friday) was quite warm. The bees were settling in, sending scouting and harvesting parties out and about and I installed the rest of the galvanised iron roof sheets on the new shed. By early evening, just as I was high off the ground and installing the steel ridge capping (which is simply a fancy name for the bit of steel sheet that stops water from getting into the shed roof at the very highest point of the roof), a few intermittent splatters of rain began to fall from the sky and land on both myself and the roof of the shed. The rain was not very heavy though and I was able to finish off the roofing on the new shed without falling off it! 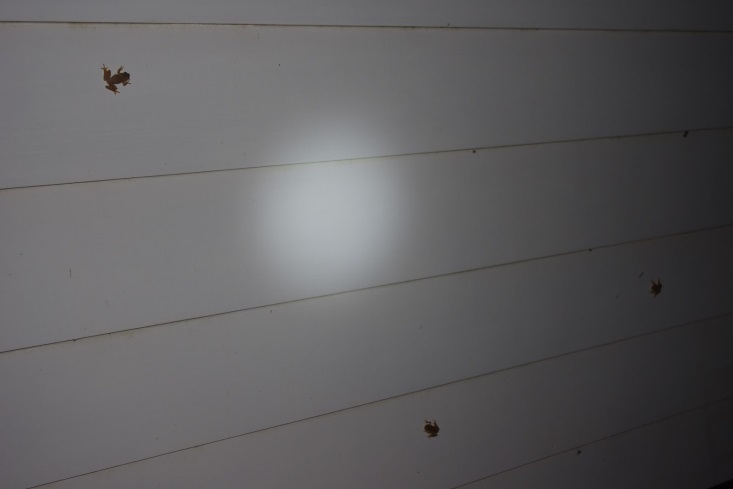 Later that night as Scritchy and I were walking about the property, I spotted several frogs on the wall of the house eating insects that were attracted to the garden lights. 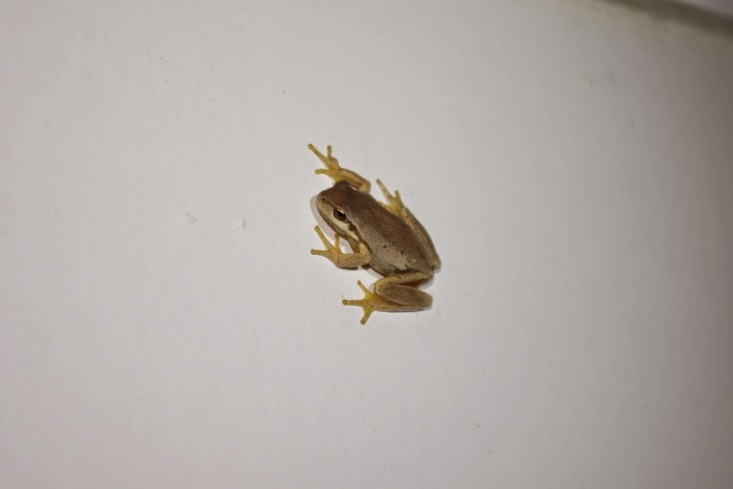 The frogs are southern brown tree frogs and are quite common here and are often heard, but rarely seen. Usually they climb up onto the house when they are seeking shelter from heavy rain. I thought at the time that it was interesting, but didn’t really think much more about the frogs. As usual, when the wildlife starts doing unusual things, it would be wise to take note and ponder what it all means. Anyway, later that night, it started raining, and then it rained a bit more, and then just kept on raining. As I write this, the rain has slowed and may be coming to an end. All up 77mm (a bit over 3 inches) of rainfall was gratefully received here at the farm over the past few days. Outside work has come to a complete halt during that rainy period. For the benefit of the readers of this blog, during breaks in the rain, I took a series of photos of some of the water catchment systems whilst they were in action. The big rock at the bottom of the photo sits on top of an underground large 300mm (1 foot) concrete pipe (the technical name for this is a culvert). 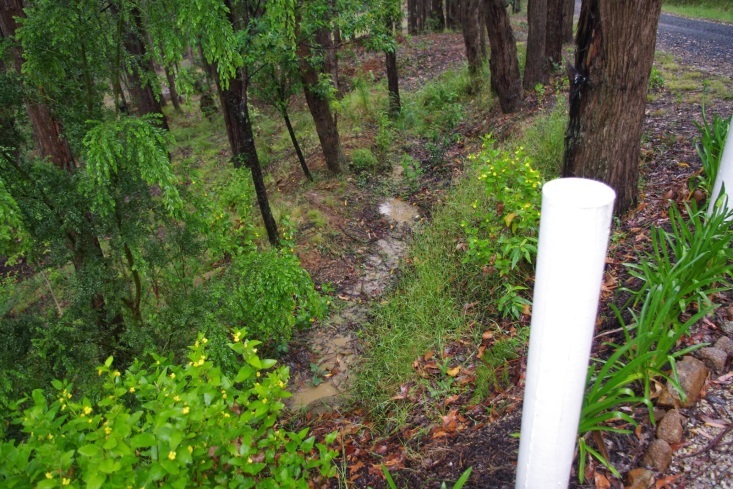 This pipe channels the water from the road under the driveway and into a swale. The purpose of the swale is to slow the movement of water so that it can drain into the ground water table, increasing the water held there in the ground. It just so happens that this swale is at the top of the orchard. This simple system saves me the effort of having to regularly water that part of the orchard. And the water collected from the road is a massive volume as the road covers an area of 400 metres x 5 metres = 2,000 square metres (or 2,392 square yards). That’s a whole lot of water which gets stored in the ground away from the harsh summer sun! The other compacted areas at the farm are just outside the house on the white rocks which have been slowly compacted over time. Water has to be drained away from that area. The netted strawberry bed next to the drainage channel is highly productive. Also, you may spot the barbeque grate (leaning on its side against the rock wall) which I use as a sturdy removable bridge to cross the drainage channel. That drain channels water past the large water tanks and downhill into a swale. Again the purpose of this swale is to slow the movement of water and allow it to infiltrate into the ground water table. 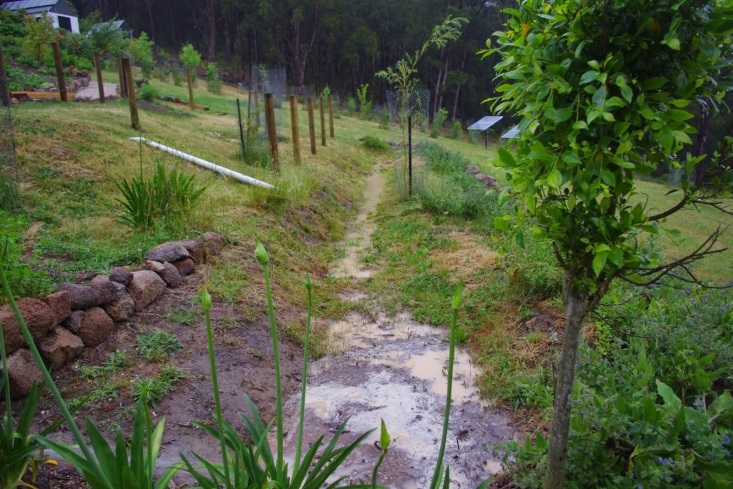 When the main house water tanks become full and overflow – as they are now, they also dump any excess water into this swale. That drainage channel only takes half of the water from that location just in front of the house. The other half of that area is piped under the white rocks and drained into the citrus orchard. 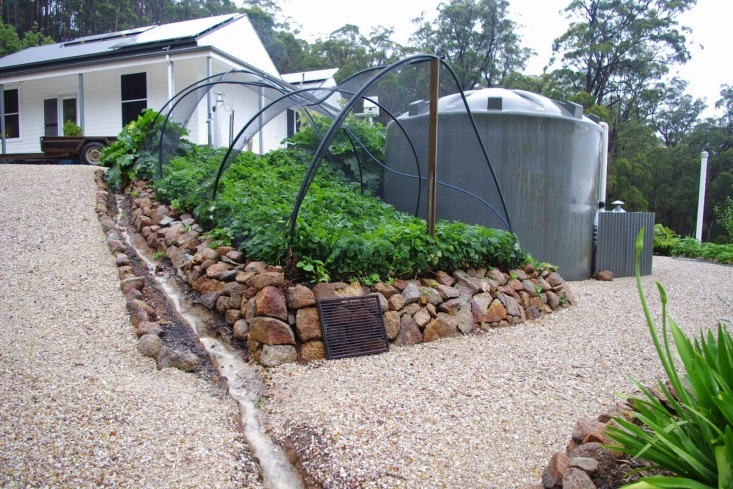 The 150mm (half a foot) pipe drains water into a very large pit of composted woody mulch so that it quickly disperses into the ground water table. It works so well that I don’t ever recall having to water the citrus fruit trees in that location despite the conditions. There is a very juicy Eureka lemon in the top right hand side of the photo. 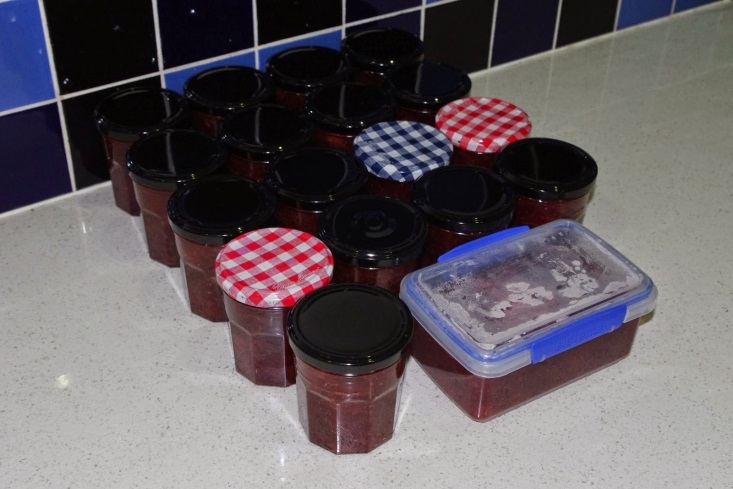 I took the opportunity of being stuck inside to convert the strawberry and rhubarb harvest into jam. Oh yeah, it’s good! Bottling (canning) of apricots for winter consumption has also commenced and I preserved 12 large bottles of apricot fruit too. Many thanks for all of the well wishes in last week’s blog for Scritchy the troubled boss dog. She made a full recovery from both episodes and is feeling much better now, thanks. My grandfather had a large house and at one stage it must have had a tennis court in the rear garden. The only reason I could tell that it must have been a tennis court was because there were neat asphalt (bitumen) paths with the occasional paint marking between the dead straight rows of mounded vegetable beds. You see, my grandfather clearly had no real economic need to grow his own vegetables, but because he’d grown up in the Depression era he had a clear understanding of just how tough things could get. He always said to me: “Those that can see ahead, get ahead”. Honestly, as a child, I thought he was talking about driving a car, but I think I understand him better now. Did I mention that the garden beds were in neat, absolutely parallel rows dug out of an old tennis court? It was uncanny how well planned that garden plot was. 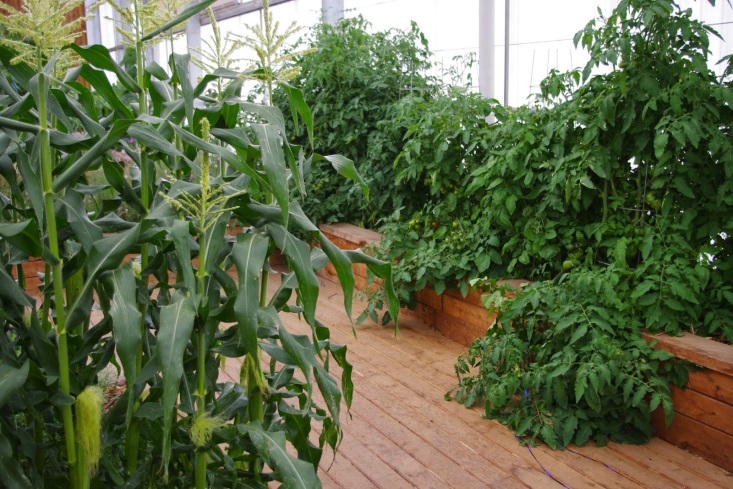 Back in those days, a raised garden bed was nothing fancier than a raised mound of soil into which vegetables were planted. None of the rows contained the same crops either, as they contained anything and everything when it came to edible plants. I have fond memories of browsing on fresh radish with its sharp, but zingy taste straight from the ground. I don’t ever recall him spraying anything other than water. Weeding generally involved me being directed to remove certain plants that had taken root. The whole garden was simple and productive and it introduced me to a world of wonder and delight. 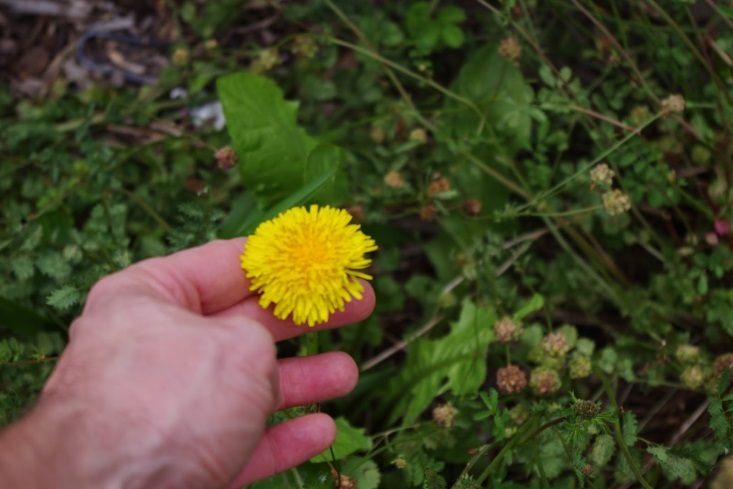 To a child’s mind, the ability to take a plant and make more plants – some of which you can eat – is a true source of wonder and I owe the old guy a debt of thanks. Many years after my grandmother died, my grandfather remarried a younger woman who had a family of her own and as often happens with the original family I saw my grandfather less and less until just before his death. Of all the things he had faced during his life – including that of a bomber pilot in WWII – he mostly feared retirement. He avoided this fear by dying several weeks prior to his retirement date. The temperature outside here at about 3.30pm is 13.7 degrees Celsius (56.7’F). So far this year there has been 805.0mm (31.7 inches) of rainfall which is up from last week’s total of 732.2mm (28.8 inches). The boss dog here is nicknamed, “Scritchy” and she is so nicknamed because without warning she will jump up and scratch your legs out of sheer exuberance for life. Scritchy is a white short haired miniature Fox Terrier. Like all boss dogs though, Scritchy has her good and bad habits. One bad habit is that she like to sunbake and the hotter it gets, the more she likes it. Yesterday, I think it would be fair to say that it was fairly warm here. 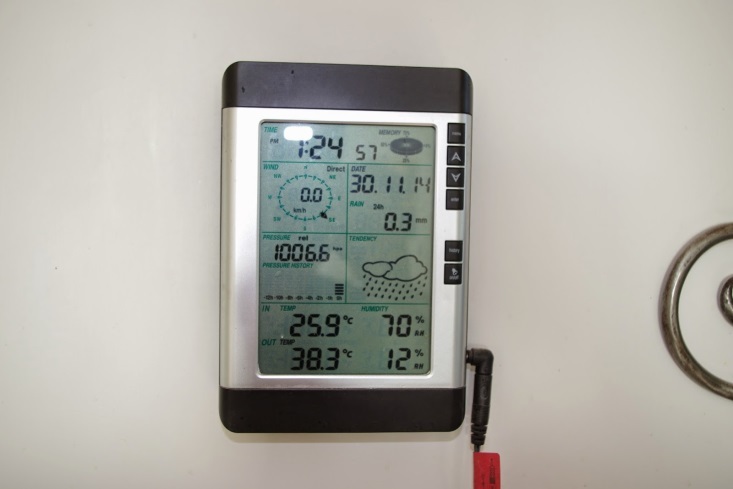 At 7.24pm I took the following photo of the weather station which displays the inside and outside air temperatures. For those that don’t use metric, inside the house it was 25.9’C degrees Celsius (78.7’F), whilst outside, the air temperature – in the shade – was 38.3’C degrees (100.9’F). Have I mentioned before just how much I love having the weather station here? Very observant readers will note the 0.3mm (0.01 inch) of rainfall recorded which was from testing the bushfire sprinklers that afternoon – which incidentally also has the added benefit of cooling down the sprinkler operator! Back to Scritchy the boss dog. Scritchy had been sunbaking, whilst I was installing galvanised steel cladding on the new shed (more on this later). Being boss dog here is a good job if you can get it. Dude, what’s wrong with you? It’s really hot out there! By 2pm, I’d called it quits as the sun was intense and I had no desire to suffer from the effects of heat exhaustion. During summer, I get up at sunrise to get things done around the farm. Waking up at sunrise is not my natural inclination and so by 4pm, I was quietly having a siesta which some people these days unceremoniously refer to as a disco nap. Scritchy retired into the house at about the same time where she also proceeded to have a quiet nap. However, this morning, Scritchy was not her normal exuberant self. She toddled onto the verandah, swaying slightly from side to side with her back arched in an unusual pose and couldn’t make it down the stairs on her own. At that point, I thought to myself: looks like I might have to get a new boss dog. Anyway, I thought about what may be ailing her and put two and two together and realised that the dog was suffering from heat exhaustion. As they say Down Under, Scritchy was: “coming down like a mongrel”! It is probably a fair thing to say that Scritchy felt this morning as if she had the worst hangover in history. A good cure for heat exhaustion is to increase hydration and get some salts into the patient. In these situations, rehydration solutions work for me, so I thought I’d try something similar with Scritchy. Needless to say, dogs don’t naturally like to consume salt, so I had to bribe her with a mix of peanut butter and salt plus some beef jerky (which I keep on hand as a dog treat). She appears to have now made a full recovery. It isn’t all about dogs that have cooked their heads this week as the new shed is now in the process of being clad with galvanised steel sheeting. The photo below shows the new steel shed behind the white shed – which soon will become the farms cantina. In some parts of the world, a cantina is a Mexican bar, but here a cantina is the place where preserved goods and all of the miscellaneous equipment required to produce them are stored. Hopefully, all being well, by next weekend all of the cladding will be installed onto the shed and the drains on the roof can then channel any rainfall into the storage tanks for later use. Mowing the farm by hand has also continued this week. It is a big job, but at least it only has to happen once a year. Because of the strong sun, early mornings are the only time to mow the herbage now. The above photo shows just how long the herbage can grow at this time of year. 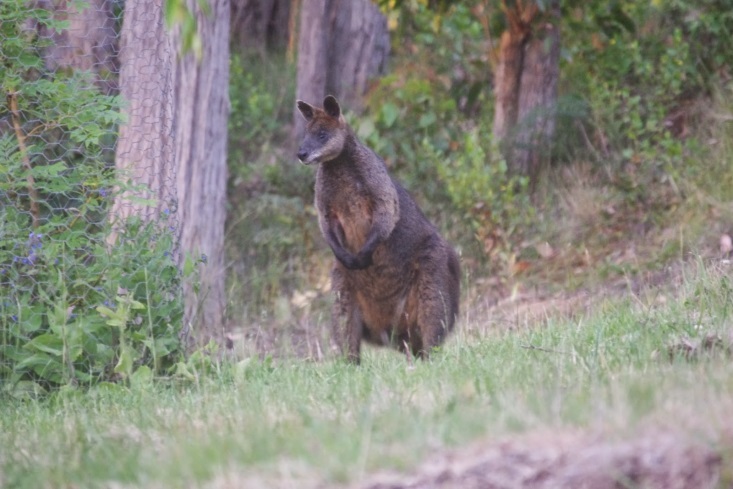 For the remainder of the year the native animals browse the herbage which keeps it short. However, at this time of the year, the herbage grows much faster than they can eat. The push mower that I use cuts and mulches the herbage and I simply let the end product fall out of the mower. 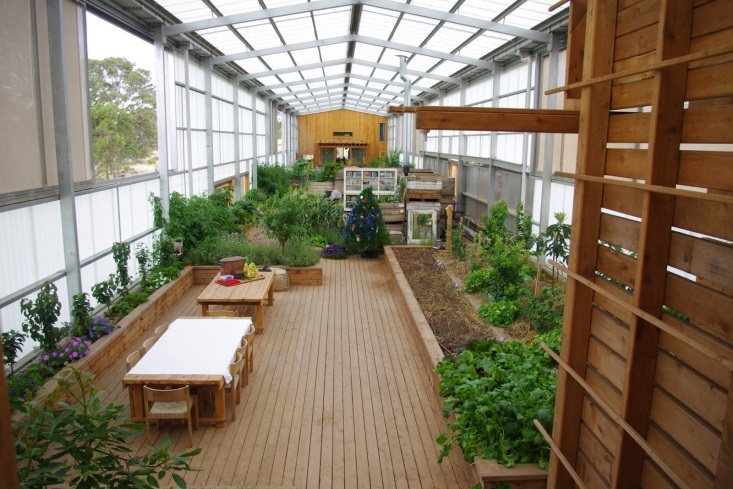 Within a few weeks, the insects and soil life here ensures that there is nothing to be seen. The geeky technical term for this process is called: “chop and drop” and it is a good way to speed up the process of building top soil. I am always stunned to see people carting away mown grass only for all that organic matter to end up in a landfill. 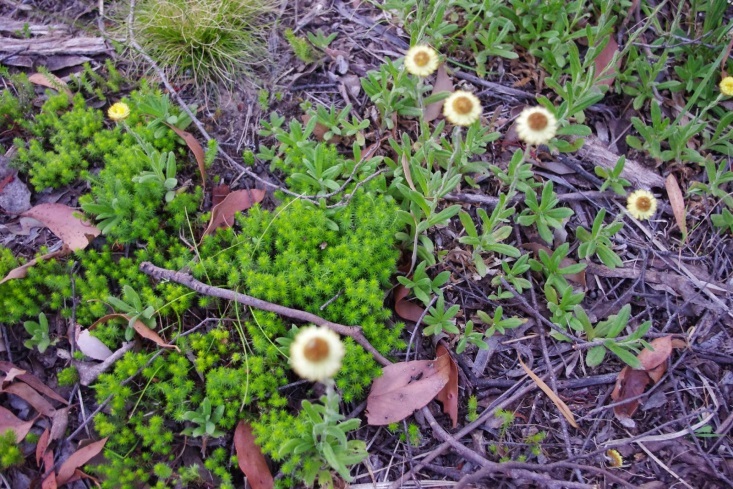 The yellow button flower is a Button Everlasting and the green mossy plant is known as a Honey Pot. But also, Bidgee-widgee’s, Dichondra Kidney-Weeds, Tall Bluebells and the carnivorous Tall Sundew are all becoming more common under the canopy of the Eucalyptus forest as I continue the process of speeding up the recycling of organic matter by simply chopping and dropping whatever is there. 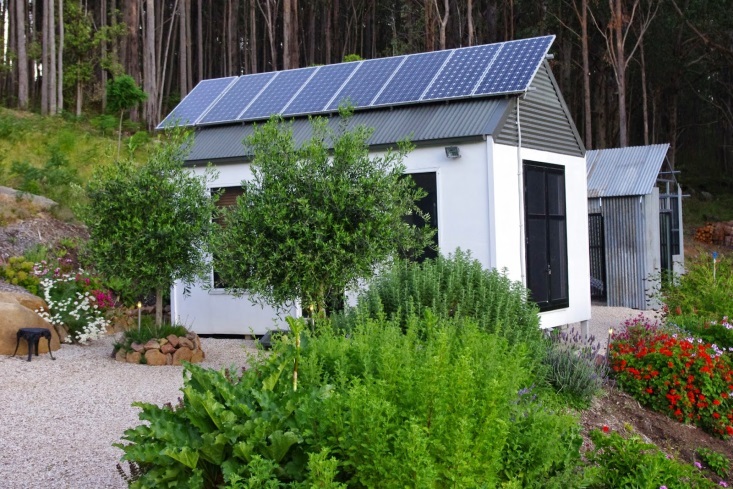 With an increase in the health of the top soil and the diversity of plants at the farm, so to have the insects increased in number and diversity. 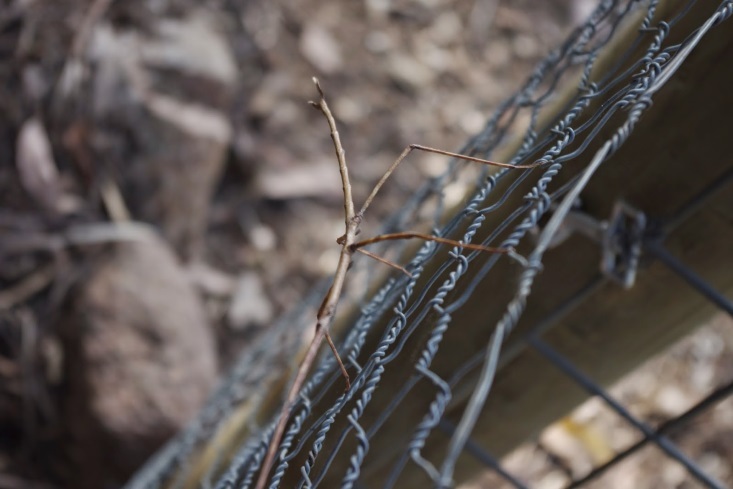 I captured a photo of this stick insect. She’s a big insect and you can see in the photo below there is a treated pine post to put her into some perspective. 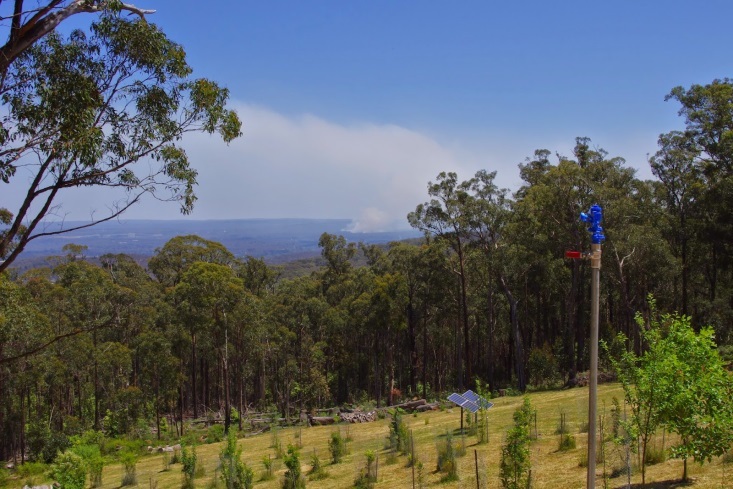 Last week, the state government – which incidentally changed hands after the weekend’s election – continued with the forest fuel reduction burn offs around the mountain range. This week, they burned the forest in Macedon. The strawberry harvest has continued this week. With the bit of extra heat, the plants have gone feral and I now have a massive quantity of strawberries. Certainly there are now far too many for me to eat – and believe me, I have valiantly tried! 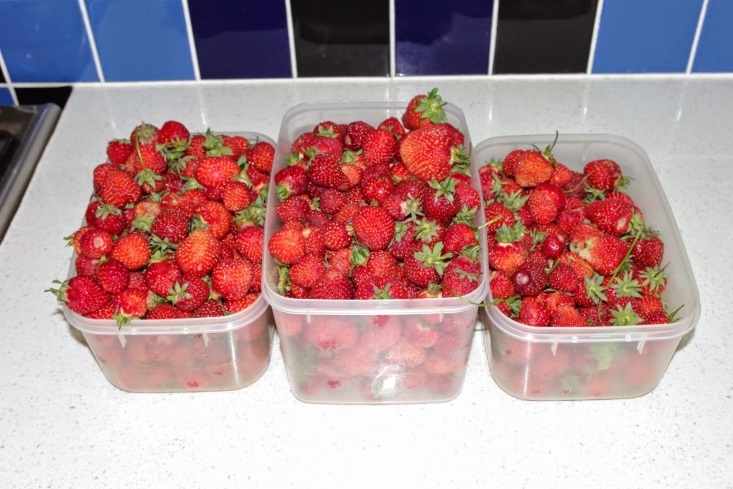 The photo below shows strawberries awaiting their fate of being converted into a strawberry and rhubarb jam. 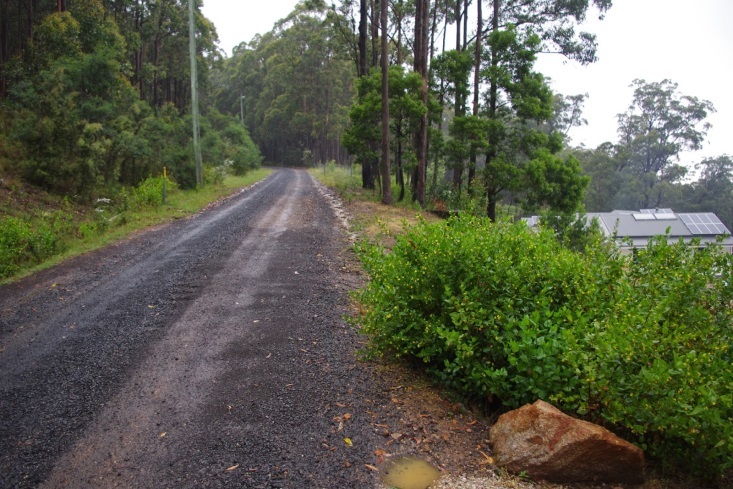 When I was a wee young lad, my grandfather used to take me camping up into the high country to a spot he and all his old World War II drinking buddies knew about on the Jamieson River. It was a very remote spot, far from any town. His mates were a rough lot too, from all corners of society (high to low), but they shared a common heritage and experiences. I suspect it was a form of therapy and ritual for them, and I was brought along to keep out of the way and fetch the water and firewood. My grandfather worked in the very top end of town, so he always had the final say on matters and I was tolerated. It was a highlight of my youth because I could run feral, explore the bush and nobody seemed to mind – as long as I kept up the delivery of water from the river and firewood for the fire-pit. The old guys put up a massive permanent heavy duty, all seasons tent plus outside all weather shelters, bedding and permanent fire pits. 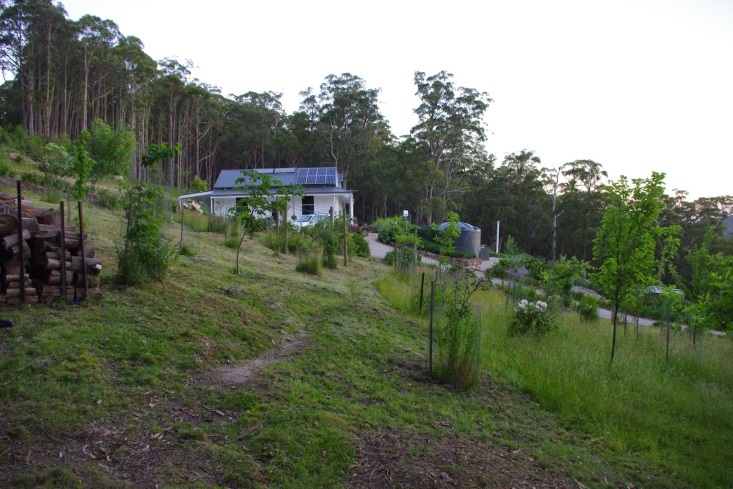 The state government in their wisdom demolished the site a few times as the site was on Crown land (i.e. government owned land). The old guys usually said to hell with what the government thought, so every time their gear was demolished, the old guys simply came back and just built a bigger and better site. They clearly felt that they were owed for their sacrifices and as a youth I was completely oblivious to these machinations. So, running around the high country, like a complete feral, I learned to love the mountains and forests of this part of the world. The temperature outside here at about 7.00pm is 24.4 degrees Celsius (75.9’F). So far this year there has been 732.2mm (28.8 inches) of rainfall which is up from last week’s total of 717.2mm (28.2 inches).